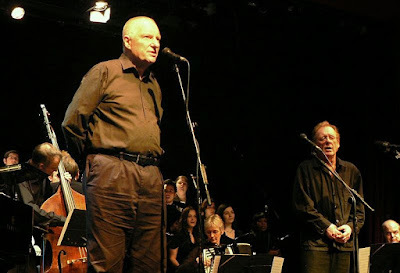 The performers, at a packed Kings Place Hall One, were Kate Westbrook and Phil Minton, voice, and a quartet: Chris Biscoe saxophones, Billy Thompson violin and Steve Berry double bass, with Mike Westbrook himself at the piano. Behind them were the 36 strong London College of Music Chorus, with regular Westbrook performers Martine Waltier and Billy Bottle as guest members. As in many previous performances, the choir was conducted by Paul Ayres. The piece began with an evocation of the clamour of Blake’s London streets, a hubbub created by all the voices and instruments on stage. Out of this emerges London Song (…In every voice, in every ban, The mind-forged manacles I hear…. ), movingly sung by Kate Westbrook. Next Let The Slave, (Let the slave grinding at the mill run out into the field….) introduced by Billy Thompson’s haunting violin, then Phil Minton’s commanding unaccompanied solo voice. There is a huge emotional swell as the piano and chorus join him. By the time Mike Westbrook rises from the piano to recite The Price of Experience (What is the price of Experience? Do men buy it for a song?...) the audience are clearly so moved that some of them are openly weeping. The piano and choir take up the theme and Billy Thompson provides an astonishingly passionate solo giving the audience their first chance to applaud and release some of the tension. This is an extraordinary musical experience. After this outpouring of emotion, we are soothed by a gentle piano introduction to Lullaby, (Sweet dreams form a shade, O'er my lovely infants head) tenderly sung by both vocalists, with delicate and subtle soprano sax from Chris Biscoe. This was followed by the harrowing Holy Thursday. A brilliant extended piano introduction leads into an expressive and chilling vocal from Kate Westbrook (…Babes should never hunger there, Nor poverty the mind appall…) and some powerful and intricate playing from the quartet in the ensuing musical chaos. Blake’s two best known poems The Tyger (Tiger, Tiger burning bright..) and its counterpart The Lamb (Little lamb, who made thee…) came next. Blake originally set both these poems to music – music now lost. Steve Berry begins with a rhythmic tigerish bass solo, joined by Billy Bottle on vibraslap. The choir sing first one poem and then the other, and then both melodies gracefully woven together. A Poison Tree is a dark tango from Kate Westbrook with Billy Thompson’s Piazzolla (or is it Stravinsky?) -tinged violin, dancing across the stage as he plays, thrilling the audience. The strange cautionary tale of Long John Brown and Little Mary Bell, is presented almost as a blues, with Phil Minton taking the lead, the choir providing a backing chorus to his extraordinary voice. The intensity of his delivery, and its emphatic Southern Baptist preacher phrasing (…Long John Brown had the Devil in his gut..) is terrifying. Steve Berry’s soulful bass solo opens The Human Abstract. The other musicians come in one by one, with marvellously plangent piano throughout, and heartfelt and affecting singing from Kate Westbrook. Optimism returns when Phil Minton starts singing The Fields, that most London of Blake’s poems (The fields from Islington to Marybone, To Primrose Hill and St. John's Wood….) with huge hymn like chords from the piano. When the choir and the other instrumentalists join in and the music swells, we are in some sort of magnificent Blakean temple. The final song I See Thy Form (..bright as fire..) has a gospel-like chorus from the choir, and the musicians give their all. Phil Minton, at his most Welsh tenor, sings with clarity and passion ensuring we hear every one of these extraordinary words. The audience rose in a long and loud standing ovation. The next performance of The Westbrook Blake is on Friday 19th May 2017 at the Bury St Edmunds Festival.